In June 2000 I was 33 years old, working in Oregon as a wildlife biologist with Threatened & Endangered Species, and my life quickly changed. I began having headaches that felt like my skull was going to explode. An MRI showed my brain was hemorrhaging and I went into surgery at OHSU in Portland Oregon. An acorn sized Glioblastoma Multiforme (GBM) tumor was found in my left temporal lobe. I was told I had less than a year to live. My husband Matt and I had two little boys, Grant and Clint, only 3 and 1 years old at that time. I quit my job as a wildlife biologist and became a stay at home mom, wanting to spend every precious moment with my boys. I went into conformal brain radiation. I did not take chemotherapy at that time, the standard treatment was BCNU and had seriously bad side effects and I was told it would only add 3 months to my life. I decided to focus on my family and doing everything I could to boost my immune system. I started eating organic, exercising 5 days a week, simplifying my life to reduce stress, leaning on God for strength and started taking many herbal supplements. In July 2004 the GBM came back. I went into brain surgery #2 with Dr. Berger at UCSF. I had “awake” surgery since the GBM was located in my left temporal lobe there was a high risk of loosing my ability to speak. After surgery I went on Temodar, the 5/23 schedule 330mg. I was on the Temodar for 1.5 years. In March 2004 the GBM came back again. 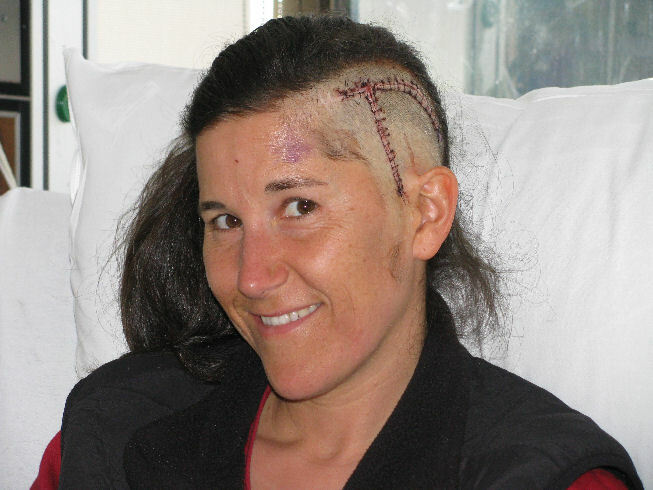 I went into brain surgery #3 with Dr. Berger at UCSF. Again I went into “awake” surgery, because Dr. Berger wanted to be as aggressive as possible in surgery, not only taking the tumor out, but buffering around the tumor if possible. The tumor was only the size of a “pea”, but during surgery Dr. Berger was able to remove a buffer around the tumor the size of a “golf ball”, hoping to remove any hidden cancer cells. After surgery I went back on Temodar 5/23 schedule 330mg. In March 2009 the GBM came back again while I was still on Temodar. This time the tumor was not even located in my brain, but in the Meninge (the layer of tissue that covers the brain). I went into surgery #4 with Dr. Berger at UCSF. He was able to remove all seen tumor. The brain itself looked nice and clear, no seen tumor in the brain itself! Good news. After surgery, I did not go back on Temodar since it quit working for me. I did not qualify for any clinical trials, because of the 3rd reoccurrence, and treatment history. The only thing available to me was the “old” chemos that are not hopeful, or Avastin, which I did not hear good things about. So Dr. Butowski at UCSF suggested I just “keep an eye” on it with MRIs every 2 months. It is now February 2011 and I am still alive and loving life! My MRIs over the last few years have looked nice and clear. I am still on no treatments, but continue doing all I can to boost my own immune system. I’m still taking many supplements (working with Jeanne Wallace), exercising, eating organic, eating good healthy foods, and giving it all over to my Lord. It’s now been 10 years! The best years of my life! I have been blessed to see my boys grow, they are now 11 and 14 years old. Now my “job” in life, is being the best mom I can be, and reaching out to others who are battling the brain tumors. My heart goes out to all of you out there. It's now Feb 2012 and I've survived the GBM 11 years and 8 months, yes I count down to days and hours too! I'm still alive and loving life. Currently on no "western medical treatments", but still taking many supplements, exercising, eating organic, acupuncture, and leaning on God for strength. My last MRI in Jan. 2012 showed there was no seen tumor; great news. However, radiation and treatment damage is beginning to show up more. The MRI report says there are scattered foci of microhemorrhages in my left hemisphere due to post treatment changes and / or radiation induced cavernous malformation. I am starting to notice more problems with loss of words, memory, reading, thinking clear, etc. But still out there having fun in life with my family camping, skiing, biking, hiking, backpacking, rafting, canoeing, too many to list. I never let the GBM beat me while I am still alive. I'm still going to enjoy each day I've got. So if you have just been diagnosed, don't give up hope!! It is now July, 2012 and I have survived the GBM for 12 years!!! To celebrate, on July 3rd, my husband Matt and I climbed to the peak of California's Mt. Whitney (>14,000 feet elevation). Back in 2009, after I had been on Temodar for two years, the GBM reoccurred for the 3rd time, and I went through brain surgery #4. As I recovered emotionally and physically, I never thought in the future I would have the energy to climb to the peak of Mt. Whitney. The statistics look ugly with the GBM and the treatments we go through are not easy, there are times we feel we do not have the energy to do our daily simple chores. But keep up the hope, fellow GBM brain tumor patients, because all things are possible. We never know what the future brings, but we can live each day for the hopes we have! I had been hoping to climb Mt. Whitney since back in 2004 after I climbed Mt. Shasta. I was physically and emotionally knocked down in 2004, 2007 and 2009 when the GBM came back three times! It seemed like my dream of climbing Mt. Whitney would never come. According to the statistics, I would be dead by now! But with hope and patience, I kept working for my dream and three years after my last brain surgery, in 2009, I finally had the energy to do it. So please you brain tumor survivors out there, don't give up hope. Live for the dream you have in your heart, it empowers you! All things are possible. It is now January, 2013 and I have survived the GBM 12 ½ years! My last four MRIs have shown two new "nodules" located on the edge of my tumor cavity. I am getting an MRI every 6 weeks to keep a close eye on them. They have not changed much, only about 4mm in size. But they look suspicious like either the GBM is back or there are two clusters of malformed vessels caused by my last surgery. I am being patient and am at peace waiting from MRI to MRI. I feel physically great, out having fun cross-country skiing this winter in the beautiful snow. In terms of my brain, I am having a harder time understanding what people are saying if there is background sounds or they talk too fast (diagnosed with "audio processing disorder") Overall, I am out busy with my family loving life!!! It is now July, 2013 and I have survived the GBM 13 years! In March, 2013 I had a fourth recurrence of the GBM. On March 13, 2013 I went through my fifth brain surgery to have the GBM removed. It was located in the "Dura" that was located over my tumor cavity. All seen tumor was removed, and I recovered from surgery quickly. Each year I plan to do something to celebrate being alive! Last year, I climbed Mt. Whitney and it felt SO good! So this year, my goal is to backpack along the Pacific Crest Trail 100+ miles! My surgery was in March and, by June, I was out backpacking in the Marble Mountain Wilderness! So far I have covered 48 miles, carrying a backpack usually about thirty-nine pounds! No one would guess I just went through my fifth brain surgery. Next week I head out into the Three Sisters Wilderness in Oregon to cover an additional 57.5 miles along the Pacific Crest Trail. I am so excited! I feel physically healthy. I will not deny that my brain is challenged! I have a hard time with loss of words and understanding what people are saying. My tumor was in my left temporal lobe, which effects language. And I get fatigued often, from my brain being over-stimulated. But overall, I'm out loving life! So you brain tumor fighters out there, keep up the hope! If your GBM comes back, there is still a chance you will survive and keep having fun in life!!! I feel like I can breathe again. On January 13th, 2014, I had my last MRI and got good news. The tiny 4mm "thing" that showed up this last August, looked the same. It consistently looked the same on my MRIs this past September, November, and now January, 2014. My neuro-oncologist in the past thought is was likely the GBM back again, but since it has not changed over the last five months, he now thinks it is just a cluster of arteries. Over time, radiation often causes "vessels" to weaken and break down; in response our brains can try to "fix" it by growing new tiny arteries around the damage. So at this point, we are moving ahead thinking it is NOT recurrence #5. GOOD NEWS! Again, wow, I can relax (a little) and breathe again. I will get my next MRI in April, 2014. Three months! That is the longest time I have had between MRIs in a long time. It is amazing that how you "feel" can change overnight. As the MRI drew closer, I began feeling more like a cancer patient, depressed, stressed, weak, fatigued, like life was so limited. Then I got good MRI news and I felt like a new person. This morning I woke up with energy like I could do anything. It is hard to describe the difference, but it is like from death to life! It is so scary how much power our "thoughts" can have over how we feel. I know this from my experience, but I still can't control it well. I need to keep telling myself over and over again, when I am having a "hard" time, that it can (will !!!) get better. It's crazy how I can go from feeling like curling up on the couch and rotting away, to the next day feeling like I could run a marathon! Talk about an emotional roller coaster ride. And for me, this "hard" time lasted 5 months, since getting questionable MRI news this past August. Talk about being "traumatized". My heart goes out to you other brain tumor patients and caregivers going through the same struggle. It's not easy. But please hold on there, when you are having a hard day (or months!). It can get better! Keep telling yourself that over and over (like I try to do myself!). I will continue doing the same things – alternative treatments. Taking the many supplements each day and eating organic. I followed the Ketogenic diet for 2 months, but it was too hard for me. So now I am following the "Paleo" diet, low on carbohydrates, but you can eat more veggies and fruits. And one day a week, I am letting myself eat the "bad" stuff (high carbs). So I can have popcorn at a movie; or bread at a restaurant! But only one day a week! (well, I am bad when on vacations). I had been on the DCA for over 2 months, but went off of it when my feet started to get numb. I love backpacking so do not want numb feet! So I started taking Metformin a couple weeks ago instead. Only 250 mg a day at this point; I may go up to 500 mg (I know of some cancer patient taking 1,000 mg+ a day). There is more research out there on how it helps fight cancer, so I will stick with it! I am also continuing to take the medical marijuana. I hate the stoned feeling the THC cannabis makes me feel, so I am only taking the CBD cannabis. I take about 0.1 gram each night at 8 pm and it helps me relax in the evening and sleep like a rock at night. There is more and more research showing how it helps fight brain cancer too!!! I will keep exercising five days a week, sleeping 8+ hours each night, simplifying life to reduce stress, and giving it all over to God who is the foundation of my peace, HOPE and joy. And just as all my brain tumor friends, I will continue to live from MRI to MRI. Hoping that we will all get some good MRI news in 2014. The "spot" my neuro-oncologist, Dr. Butowski at UCSF, was tracking ended up being a 5th recurrence of the GBM. In May 2014, I ended up going in with Dr. Berger at UCSF for brain surgery #6 !!! All seen tumor was removed. There were actually two tumors, both small, one 4mm and the other 7mm. Pathology results showed that only 30% of the "mass" was Glioblastoma Multiforme. The other 70% was "gliosis" which is a type of alive growing scar tissue (not as bad as the GBM)! I recovered from the surgery VERY fast and well. Within weeks I went out camping at beautiful lakes and backpacking into the wilderness. Physically feeling GREAT. I am having a harder time with language, but I can live with that! My neuro-oncologist at UCSF recommended I keep doing what I'm doing (maybe my "alternative treatments" is what kept the GBM from growing much, and 70% ending up being scar "gliosis"). So I am continuing with the Metformin. I am now on 1,000mg a day. I take 250mg with breakfast, lunch, dinner and at bedtime. I am also still taking some DCA. I take 12mg/kg. I have been taking it about 5 days on, then 5 days off. If I stay on it too long of a time, my feet begin to get numb. So I go off and on. It varies all of the time though, because I travel a lot. This month I will go on it about 10 days, then off about 15 days. It varies. I am also staying on the medical marijuana. I get it in the "Rick Simpson's hemp oil" format. I get high THC cannabis and also high CBD cannabis oil. Since I HATE feeling stoned, I take it at night before I go to sleep. Also, I learned about the "Citicoline CDP Choline" that helps to take away the stoned feeling. So I take the Citicoline at about 8:30pm (take it one hour before the THC). Then at about 9:00 PM, I take the THC, then at 10pm I take the CBD. I was told to take the THC about 30 to 60 minutes before the CBD (makes it work better). I squeeze some of the THC and CBD on my finger and rub it under my tongue, so it absorbs fast and better (if you eat or smoke it you do not get as good of a dose absorbed). Then at 10:00 PM I go to sleep and sleep like a ROCK!!! I also continue to eat an organic, low carbohydrate diet, exercise 5 days a week, reduce stress and simplify life, I take MANY supplements, eat good healthy food (OK, I do eat some ice cream in the summer – I'm BAD). And most of all, I lean on God for strength (otherwise I would have given up by now). I get my next MRI on October 1, 2014. I take it day by day. Living in the moment. Loving each second! It's now Nov. 2015 and I have survived the grade 4 GBM for 15 years and 4 months. I'm still out enjoying life! In August 2015 I did have my 6th recurrence of the GBM. The good news was, it was tiny only 3.2 mm in size, located on the edge of my tumor cavity. The bad news was, Dr. Berger at UCSF considered it inoperable because the tumor was adjacent to a critical artery. So instead of surgery, in August 2015 I went through Gamma Knife Radiation. Gamma Knife is a one day (in & out) treatment. It goes fast and was VERY easy compared to surgery. In October 2015 I just had my first MRI post Gamma Knife and things looked good. About ½ of the GBM tumor is gone!!! The Gamma Knife seems to be doing its job. My neuro-oncologist at UCSF (Dr. Butowski) seems confident that my next MRI will even look better. So I keep up my HOPE. I'm planning on celebrating this upcoming 2016 New Year, and many years to come!!! It is now June 2016, and I have survived the grade 4 GBM brain tumor for 16 years (dx June 2000)! My last recurrence was August 2015 and was treated with Gamma Knife Radiation. Within 4 months after the Gamma Knife, the GBM shrunk down to nothing seen. Since then, my brain MRIs have continued to look the same, no seen tumor! Unfortunately, I've started having simple partial seizures, from the radiation damage. So I have had to start taking anti-seizure meds for the first time since I was diagnosed. Currently, I am not on any "western medicine" treatments. I continue to fight the cancer by taking many supplements, also some "off label" prescriptions, exercise 5 days a week, eat an organic low carbohydrate diet, leaning on God for strength, and other "alternative" treatments. You can read about what I do to fight the cancer on my web page at www.cherylbroyles-gbm.com Have HOPE you fellow brain tumor fighters, don't listen to the statistics. I was told I would die within a year, and now I've survived the GBM 16 years! All is possible. And I am still out having FUN with my family. I am over here in Oregon USA cheering you guys on - GO GO GO. I was originally diagnosed with the GBM in June, 2000. Between 2000 and 2016, I had six recurrences of the GBM. Now, in April 2017, I had my seventh recurrence of a brain tumor. However, this time it's not a GBM, but a aPXA (anaplastic pleomorphic xanthroastrocytoma). It is a grade 3 tumor. In the past, the GBM was always in my left temporal lobe, but now the aPXA is located in my pituitary. The aPXA is usually found in young children, and is rarely (maybe never known) located in the pituitary. Very strange. It is growing within the pituitary, and moves up through the stem, into the hypothalamus. It is inoperable. So I went through four weeks of radiation at UCSF, San Francisco, Ca. Now my biopsy of the tumor is going through a "500 Genetic" test, where they look at the genes of my tumor, then review all available chemotherapies to see which one/ones would work best for my specific tumor. Now, in May 2017, I'm back home to Oregon, waiting to hear what chemotherapy is best for me. Overall, I'm feeling pretty good. The only radiation effects so far, is the slow destruction of my pituitary. I did not realize that a pituitary seems to be more complicated and controls more than a brain does! It is a whole new world I need to learn about. My fellow brain tumor fighters, keep up the fight. Just because a tumor recurs, it does not mean life is over. I've fought seven recurrences from 2000 to 2017, and I've had GREAT times with my family. This June 27, 2017 – it will be my time to celebrate my 17 years surviving the GBM / aPXA. I was first diagnosed in June, 2000 with the GBM located in my left temporal lobe. Over the subsequent 17 years, I have had seven recurrences: in 2004, 2007, 2009, 2013, 2014, 2015, and now 2017 (this time an aPXA in my pituitary). Over the years, I have had six craniotomies. My GBM recurrence in 2015 was inoperable so I had the Gamma Knife. In April, 2017, I had four weeks of radiation for the aPXA. My last MRI in December, 2017 looked clear; no seen GBM or aPXA. So far so good! Over time I have been hit with many deficits. Some are more challenging, and others for which it is easier to compensate. Most people would never know I am battling brain tumors; I seem normal. However, my family and good friends know I am seriously suffering in the fight. Overall, I still love life and never regret the fight as it is well worth it. I am still getting out having fun with family and friends. Since my last recurrence, I have had fun with my family at Washington's Olympic Peninsula, visited more family on the Oregon coast, hugged my boys goodbye at college at Oregon State University, celebrated holidays with family, and have just enjoyed the beauty around me. So, when diagnosed with a GBM, keep up the fight, miracles can happen. As brain tumor survivors say, KOKO.